When the signup form is open for partners, a username + password is required to be able to add trades. When the signup form is open for all, both partners as well as non-partners can start new trades. which you can find under Trades - Old. 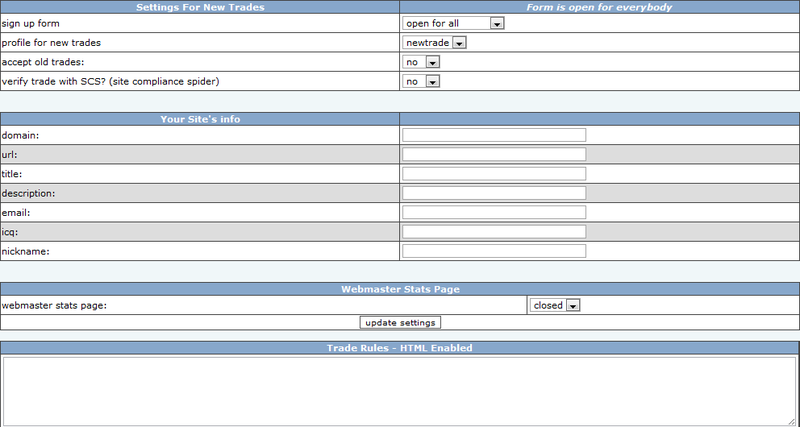 When enabled, every new trade added via the signup form is checked by the Site Compliance Spider first. If the trade breaks any rules set by the SCS, the trade will not be added. Instead the error message is displayed. so that your new trade partner can correctly add your site to his trade program. allowing them to view the statistics of their trades with you. This statistics page is accessible via the signup form. All html code written here is displayed on your signup form.